Who links The Beatles, Ken Russell, Peter Cook, Richard Lester, Fairport Convention, The Goons, The Bonzo Dog Doo-Dah Band, cartoonist Bob Godfrey (Roobarb) and Turner Prize winning artist Jeremy Deller? The answer: Mr Bruce Lacey. And if Bruce Lacey himself has somehow remained ‘off our radar' in recent times, it wasn't always like that. A legendary figure on the British counter-cultural art scene during the 1960s, Lacey has enjoyed five decades of defining cultural moments, collaborating with all manner of filmmakers, musicians and artists, and making appearances in such era-defining pop cultural experiences as Help! and Not Only... But Also. In the 1960s Lacey was known for his unpredictable humour and strong political views; his wide-ranging and idiosyncratic art practice saw him construct all manner of mechanical, sci-fi devices and robotic beings as well as exhibiting films and interactive environments in the era's groundbreaking, underground art-happenings scene. His work also made it into more overtly prestigious galleries and he was a regular on TV and in film. He was the flute-playing gardener in Help! and a mad scientist in Smashing Time. He collaborated with cult photographer-filmmaker George Harrison Marks on the comedy film Uncle's Tea Party and had a song named after him on a Fairport Convention LP. Whether over or underground, everything Lacey did pushed the boundaries. He continued on this course during the 1970s with his wife and collaborator, artist Jill Bruce (now Smith). Together, they made lively community art and explored the rhythms of the Earth through pagan-style rituals and documentation of ancient sites. Bruce Lacey exerted considerable influence on post-War culture yet, bafflingly, much of his work has remained obscure and little seen in recent years. This July, the BFI and Camden Arts Centre celebrate and revisit the richness and diversity of his output with The Lacey Rituals, a special season of his rarely-screened films and TV shows at BFI Southbank from 5 – 31 July. The Bruce Lacey Experience, a major new exhibition at Camden Arts Centre runs from 7 July – 16 September. 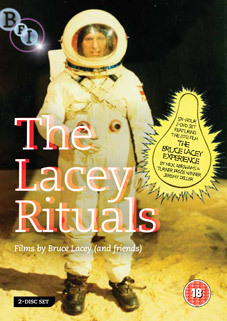 For those unable to get to either of these (and those who are, of course), the BFI will also be releasing The Lacey Rituals: Films by Bruce Lacey (and friends) as a 2-disc DVD set on 23rd July at the RRP of £22.99. This 2-DVD collection finally brings together many of Lacey's rarely-seen films for the very first time. It includes The Running, Jumping & Standing Still Film (Richard Lester, 1960), The Lacey Rituals (1973), a delightful and experimental home movie featuring Lacey's children and much more. Also featured is The Bruce Lacey Experience (2012), the new film by Turner prize-winning artist Jeremy Deller and Nick Abrahams (which is premiered on 5 July to launch the BFI Southbank season.) Accompanying the discs is an illustrated booklet of film notes and newly- commissioned essays with contributions from Richard Lester and art curator Jasia Reichardt.